Vinara Sodara Veera Kumara is one small film which created decent buzz with its promising promos. Directed by Sateesh Chandra Nadella, the film has hit the screens today. Let’s see how the film turns out to be. 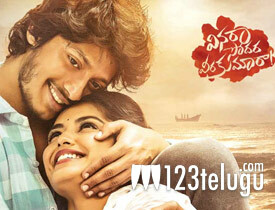 Young hero, Srinivas Sai is good in his role as the slum boy. His dialogue delivery and performance in emotional scenes in the latter half bring depth to the proceedings. Heroine Priyanka Jain is apt in the role of a college-going girl. Her acting in a few crucial scenes is impressive. One romantic song which comes in the second half will enthrall the youth audience. Noted actor, Uttej and anchor Jhansi as the hero’s parents did a decent job in the limited screen presence. A social message given at the end is thought-provoking. The biggest minus point of the film is its dragged narration in the first half. The proceedings during this time look unengaging with a flat screenplay. Lack of entertainment and enjoyable songs is also minus for the film. Though the core point is established on an emotional note in the latter half, it is not conveyed in a strong manner. The love story between the lead pair is not effectively showcased and lacks freshness in it. Director Sateesh Chandra Nadella tried to convey a message by picking by a burning social issue and succeeded partially. His idea of making a love story in the rural backdrop is good and properly showcased the village atmosphere but the narration is boring. Editing work is just about okay. The cinematography work is nice as the natural locations are captured well. Set work is impressive as the houses and other design works are convincing. Dialogues by Lakshmi Bhoopal are good at parts. Music by Shravan Bharadwaj is not up to mark and the background score is also too loud. Production values for this low budget film are decent. On the whole, Vinara Sodara Veera Kumara is a regular village love story presented with a social message. The lead pair’s acting and a few emotional scenes in the latter half are good but the lack of gripping narration and the abrupt ending will stand tall as negatives in the film and makes this film a below-par watch this weekend.